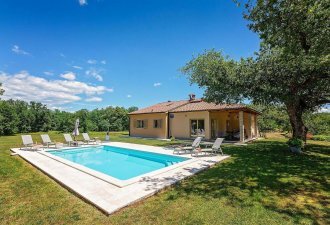 Casa Celestina is comfortable groundfloor house located in Vinez, the suburb of Labin, only 6 km from the beautiful beaches of this part of Istria. On completely closed and well maintained property of 700 sqm this beautiful house offer to the guests following features: outdoor pool of 24 sqm, two terraces with seating set, one lounge and swing for relaxing by the pool, 6 sunchairs, barbecue and two private parking spaces. House has the capacity for 8 persons on total surface of 120 sqm. It consists of comfortable living room with dining area for 8 persons and completely equipped kitchen. A little terrace that leads onto the pool is reachable from the living room. Furthermore, from the wide hallway guests have access to four bedrooms; one bedroom is with double bed and en suite bath/toilete, one bedroom is with double bed and shower/toilete in the hall, and two bedrooms each with two separate beds and one shower/toilete. This space has its own access to the terrace and the pool.